"May the Holy Family, icon and model of every human family, help each individual to walk in the spirit of Nazareth." 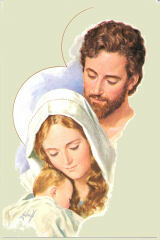 The month of February (Overview - Calendar) is dedicated to the Holy Family. 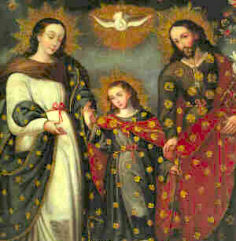 The special devotion which proposes the Holy Family of Jesus, Mary, and Joseph as the model of virtue of all Christian households began in the 17th century. It started almost simultaneously in Canada and France: the Association of the Holy Family was founded in Montreal in 1663, and by the Daughters of the Holy Family in Paris in 1674. This devotion soon spread and in 1893 Leo XIII expressed his approval of a feast under this title and himself composed part of the Office. On account of the flight into Egypt this feast has been observed by the Copts from early times. The feast was welcomed by succeeding Pontiffs as an efficacious means for bringing home to the Christian people the example of the Holy Family at Nazareth, and by the restoration of the true spirit of family life, stemming, in some measure, the evils of present-day society. In the words of His Holiness Pope Leo XIII, "Nothing truly can be more salutary or efficacious for Christian families to meditate upon than the example of this Holy Family, which embraces the perfection and completeness of all domestic virtues." Since the Holy Family observed the Jewish law in its perfection, we can deduce quite accurately what prayers they recited. The Psalms, of course, were the favorites. Three times a day Jesus, Mary, and Joseph said the Tephillah, "The Prayer," consisting of eighteen long invocations and blessings. Joseph (and later Jesus when He attained to manhood) was obliged to say the Shema, a sort of profession of faith in the one true God, twice daily. A very interesting Jewish custom of prayer that must have been observed in the house at Nazareth was that of the Mezuzah, "the doorpost," and the "phylacteries," small square calfskin boxes with Scripture texts written on parchment inside them. On the doorpost of the house at Nazareth was fastened a wooden tube containing a rolled parchment inscribed with the passage quoted above from the Book of Deuteronomy and another passage (11:13-21) citing the blessings of serving God. On entering and leaving the house the members of the Holy Family would piously touch this Mezuzah, saying, "May God keep my going out and coming in from now on and forevermore." All this was intended to show reverence for the word of God. 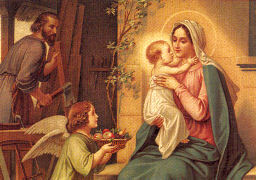 Such was the vocal and the more or less formal prayer which Jesus, Mary, and Joseph offered in their home at Nazareth. In their hearts, however, they prayed always. Just as the Heart of Jesus was constantly united with His divinity, so were the hearts of Mary and Joseph so closely bound to God that their every action was a prayer.  Excerpted from Reflections on the Life of Jesus, Mary, and Joseph, Francis L. Filas, S.J. We should ask ourselves if our own families model that of the Holy Family. We need to be open to God’s grace to value the positive and to accept our mistakes — and to be willing to rectify them. Parenting is a very challenging responsibility and at times errors are made despite the best intentions. Recognizing this, children should trust their parents and never forget that parents want only what is best for them. Which leads us to what may be the most important family virtue — forgiveness. Living so intimately within the family nucleus naturally gives rise to unpleasant situations where someone is apt to be offended. St. Paul knew this when he told us to “bear with and forgive one another.” The health of our family may depend on how quickly we learn to forgive without harboring feelings of resentment. During this Year of the Eucharist it is essential to discover the relationship between the Eucharist and family life. Pope John Paul II wrote, “In the eucharistic gift of charity the Christian family finds the foundation and soul of its communion and its mission” (Letter on the Family, No. 57).  Excerpted from The Holy Family models what family life should be, Archbishop Charles J. Chaput, O.F.M. Cap.